Guild members also donate countless hours to other charities throughout our community including the Union Gospel Mission, Veteran's Hospital and many local churches. It's great to be able to share our love of quilting with others! We, as a Guild, are proud to contribute in a large way to the Ohana Mammography Center. Through our donations women of the Yakima Valley that are struggling financially have the opportunity to receive "gift certificates" for mammograms and screening. We do this through sale of raffle tickets for our raffle quilt which is combined with our quilt show which is held biannually. Your donations are proudly accepted so that we can continue to support this program as we have done for many years. 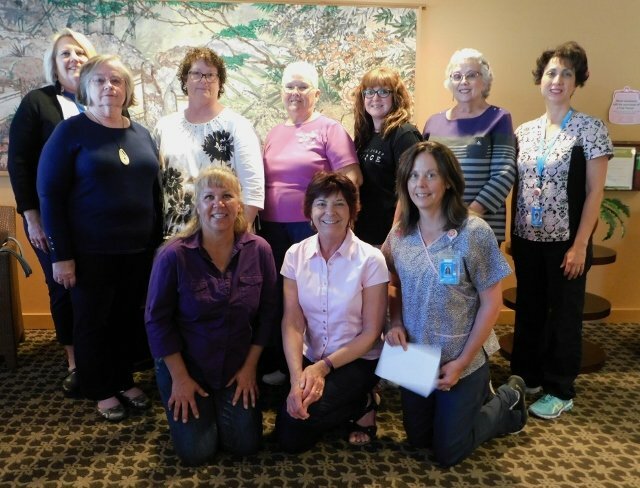 On Thursday, October 5, 2017 Yakima Valley Quilters guild gave 'OHana $5,250 for their mammogram scholarships. Since YVQG started giving to their program in 2003, we have donated a total of over $50,000. The average per scholarship is $300, so we have served approximately 170 with diagnostic care. This is something we can all be proud of! The Yakima Valley Quilters’ Guild is made up of more than 165 members who are dedicated to quilting and contributing to the community through quilting. In addition to the mammogram gift certificates, guild members regularly donate quilts to a number of community organizations throughout the year. The mission of the Yakima Valley Quilters’ Guild is to foster the art of quilt-making through sharing and teaching, sponsoring workshops, demonstrations and quilt shows. It is an organization dedicated to the preservation & promotion of quilting and other needle art through education and community service. For more information call Nancy Abbenhaus at 509-966-7762 or YVQG President, Nancy Ramsey at 509 899-1623. As everyone knows, our Guild does a lot for Ohana and it is truly a pleasure to help out in such an important place for our friends, neighbors, family members and just ANYONE in need of a little extra help. Here is one more way that you, as a quilter, can give back to your community and those that are in pain from a diagnostic procedure or even worse. There is a huge need for flannel ice bag covers; they go through hundreds of these every year. There is a group that has been making them for Ohana and we, as a Guild, are stepping up to do our part. Attached is a pattern for the ICE BAG COVERS...you can use flannel scraps to make them so if you have scraps don't run out and buy a bunch of fabric. We only ask that they are happy colors or prints! They truly can make a huge difference in how someone is feeling! CLICK HERE for the pattern which you can print and share! Click on thelink above to go to the Yakima Herald article. What if not having sanitary supplies meant DAYS without school? Days of isolation? Girls use leaves, mattress stuffing, newspaper, corn husks, rocks, anything they can find...but still miss up to 2 months of education and opportunity every year. It turns out this issue is a surprising but instrumental key to social change for women all over the world. One of the more creative and fun projects headed up by Kathy Winters is our "Shoebox Quilts". These quilts are artfully planned and cut out by Kathy, placed in shoe boxes along with the directions and then "adopted" by a guild member. They take their shoe box quilt home, sew it together, quilt it and then return it to the guild for "show and tell" and then it is donated to one of our designated charities. If you haven't tried a "Shoebox Quilt" yet, contact Kathy Winters to "adopt" one of your own! 8" x 18" or 30" x 56"
Low contrast fabrics, flannel backs, machine quilting preferred (if ties are used, they must be on top). Children's - 40" X 50" UP TO 70" X 70"
Twin Bed quilts - 75" x 90"
Baby quilts - 36" x 36"
Neonatal Intensive Care Unit (NICU) - or 36" x 36"
For more information on the charity quilts please contact Ann Wyant, our comfort quilt chair person, by clicking on her name. The ladies of the guild have been making chemo scarves over the last year to donate to Yakima Valley Memorial Hospital Oncology Department as well as North Star Lodge. These are easy to make scarves for our friends and family that are going through a tough time in their lives. We all know that chemo is not an easy road to travel and anything we can do to help is a small price to pay. Please feel free to print the pattern and make as many of the scarves as you can. You can give them to a guild member to be delivered or you can drop them off at either location. They are easy to make and only take a small amount of fabric but can make someone happy and more comfortable knowing that you cared enough to help! You may also contact us through our email - yvqg2015@gmail.com.